There's a good article in the February 2009 issue of Scientific American on electric (or plasma) propulsion systems. It explains the basic principles and the differences between ion drives, Hall thrusters, and magnetoplasmadynamic thrusters (MPDT to their friends). The article does a good job explaining the limitations of each technology and what researchers and engineers are doing to overcome them to improve thrust, efficiency, and long term reliability. 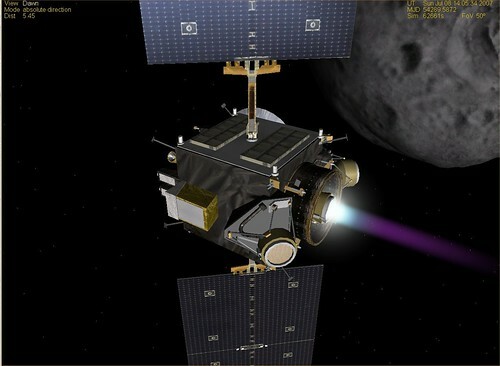 These highly efficient propulsion systems will hold the key to faster access to the outer parts of the solar system - an ion drive is already in use on NASA's Dawn mission to the asteroids Vesta and Ceres. 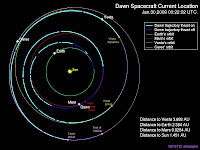 The picture above is an Orbiter screen shot I took on a simulated Dawn visit to Ceres.